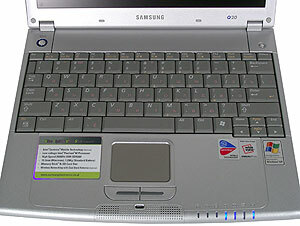 Q20 is an ultra-portable notebook positioned by Samsung as "the thinnest and the lightest of all 12.1" NotePCs". The company had to resort to a number of technical tricks to achieve such dimensions: the model has an Intel Pentium M CPU with a lower supply voltage, which ensures lower energy consumption and heat generation. Here is a table containing more technical details. As we see, Samsung Q20 is really 1 mm thinner and 50 g lighter than ASUS S5200N with a "conventional" Intel Pentium M CPU, although it is 20 g heavier than ASUS S5200NE with a Pentium M ULV CPU. But to be fair we must say that Samsung Q20 was released much earlier than the latter model. 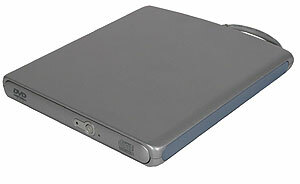 The set of interface ports is more or less standard for Centrino-based notebooks considering their dimensions and weight. 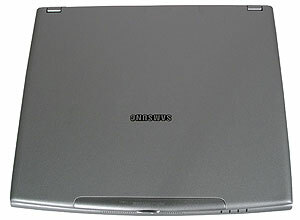 The model design reminds one of Samsung X10, so we can say that the company is forming its individual notebook style. The notebook is bright and elegant, it will look equally good as an interior article and in the student's hands. Although it is too bright, I think, for an austere office. The back end has nothing except the battery (almost as long as the end itself) and a Kensington lock. Such approach enables to install easily a battery of a higher capacity (and naturally, of a larger size). 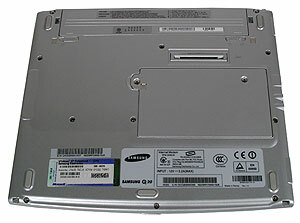 All connectors are placed on the notebook's side surfaces. 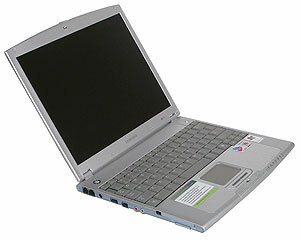 The notebook is equipped with a desktop variant of the IEEE 1394 connector, which includes power contacts. Due to this solution, an external device for ODDs or an external HDD can be used with no additional adapter  which is an essential factor considering the size of the notebook. The lower side houses an extension slot, a bay for memory and a mini PCI module, and a battery with a charge indicator (to check the charge level press on the marked place). If we take for granted the fact that the back side is occupied by the battery, then there are no claims concerning the way the connectors are arranged. Thicker cables will be plugged as close to the back side as possible and thus, won't hamper the user to work. The notebook is quite recognisable with the open cover. The grid covering the speakers in the lower part is becoming Samsung's earmark. Although the speakers are located so close to each other that Q20 sound can't be called stereo. The keyboard differs from average full-size ones by the absence of the right row. This caused a certain rearrangement of the cursor-controlling unit. The Home and End keys are located over the Right and Left, in the places that are usualy vacant in full-size keyboards, therefore, unintended touches can occur. PgUp and PgDn are integrated into the Up and Down keys, respectively, and can be activated when the Fn key is pressed. It takes some time to get used to such arrangement, but once you have, you'll find it very convenient for work with texts. Unfortunately, Ins and Del are situated too far in the upper right corner, but it is typical of most notebooks, as well as the Fn in the place of the left Ctrl of desktop keyboards. The keyboard also has another interesting feature: NumLock is charged with no additional functions, and BIOS enables switching of the numeric keys by pressing NumLock without Fn. Although the practical value of this function seems somewhat dubious. The touchpad is standard and has no unexpected features. The keys are covered with rubber material that makes them jut out and they seemed very handy for me personally. The surface is not laden with buttons, there are only two of them: the on/off button surrounded by a blue circle (which, in my opinion, would look much better glowing when the power is on); the other one performs operations specified in BIOS. It can be set to quickly access the browser or to turn off the wireless network adapter. The combination Fn+F4 is used for a fast access to an application specified by the user (calculator is set by default). The LEDs are lighted with blue, except the charge mode that has an orange LED. They look lovely but they are often shielded by the user's right hand at work. There have been no problems with the external combo drive. And I can't but praise the traditional Samsung's PSU which is stylish and also very convenient in transportations. The main heat-generating element of the model is the HDD, and consequently, the part of the case under the right palm becomes warmer. Also noteworthy, there are no air vents on the lower surface. The notebook works quietly, which is no surprise considering its platform. In general, Samsung Q20 is a bright and stylish notebook. It is convenient to work with, considering its dimensions. It can't be used as a multimedia PC as it has no Video-Out and no S/PDIF output; although the supplied combo drive that is powered directly by the notebook widens the latter's functionality as a working tool. The guarantee lasts 3 years (1 year of a full guarantee and free repairs within the next 2 years). The service centres are listed on the Russian Samsung site where it is specially mentioned which of them deal with notebooks. The Russian Samsung site deserves a separate discussion. The idea itself was good: the site contains the addresses of stores selling Samsung products, although the search system is not very convenient: for instance, in Moscow search it shows stores that are the closest to the selected metro station, and not the stores that sell notebooks. 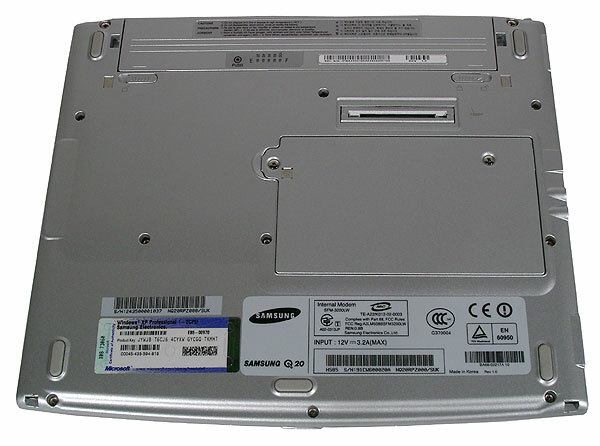 The site also provides information about Samsung models (including serial numbers that have service support in Russia), their specs and drivers. But as soon as we reach specifications, problems appear. Thus, Q20 specs include S/PDIF and S-Video outputs and a touchpad scroller. Besides, there are discrepancies from the global site concerning the maximal memory size and the maximal resolution for the external monitor. Drivers for different models are heaped into one list, but there are no drivers for Q20. While the global site, besides the specs for the model, has both the drivers and even a user guide in Russian. In other words, the Russian representation has a lot of room for improvement. Autonomous mode. Remember that we tested a model with a "standard" battery. As we see, the declared run-down time is all but reached in practice. No doubt, Q20 is a stylish model, which is becoming an earmark of Samsung notebooks. Accoding to the company's officials, Samsung is planning to occupy the niche of image notebooks in Russia, taking advantage of a weak Sony promotion. Noteworthy, the tested configuration of the model is not shipped to Russia. According to the Russian Samsung site, only four configurations are available in this country. Average current prices (number of supplies) for them in Moscow retail stores are shown in the table below.